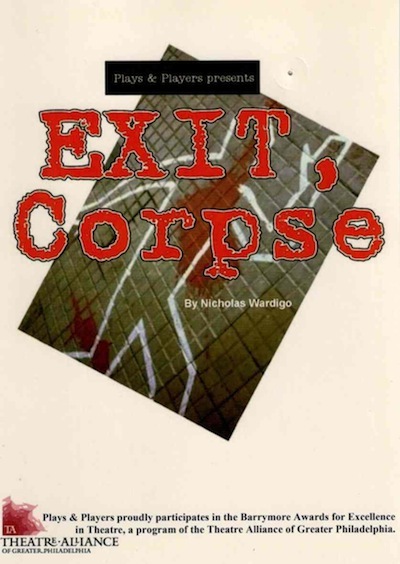 Exit, Corpse is a drama in two acts with three characters: PENNY (female, mid-twenties), MADISON (female, early thirties to early forties), TED (male, early twenties). Penny and Madison are in a bit of a pickle. Madison just shot someone in a hotel bathroom—noisily and messily—and now they need to get themselves and the body out of the room without anybody noticing. Assuming they can do that, there’s the problem of explaining to their boss, Don, how a simple exchange went so horribly wrong, particularly when both women recall events slightly differently. Madison is smart, and Penny can take direction. They maneuver through a series of plans to cast suspicion away from them, including hiding the gunpowder smell, flirting with the hotel staff, and incriminating the guests in the room beneath them. What’s slightly more dangerous is maneuvering through each other’s stories. Madison says she shot the guy because he pulled a gun first. And, sure, Penny was panicked, but she doesn’t remember seeing a gun. And where’s the money he was supposed to bring? Madison says he didn’t bring it, but then what did Madison put into the hotel safe? And did it seem like the guy knew Madison? But maybe none of that is important. Maybe all that really matters is two strong women watching each other’s backs and pulling through a tough situation triumphantly. Don sends them the means to their salvation: a set of FedEx boxes, hacksaws, sledgehammers, and a lot of cleaning products. They spend all night processing the corpse into something FedEx-able, and by morning, they have formed a tight, almost sisterly bond. They faced adversity with grace and intelligence, and now there’s nothing they can’t do together…until a misstep causes the entire plan to unravel, and Penny learns that there isn’t anything Madison won’t do for her own survival.